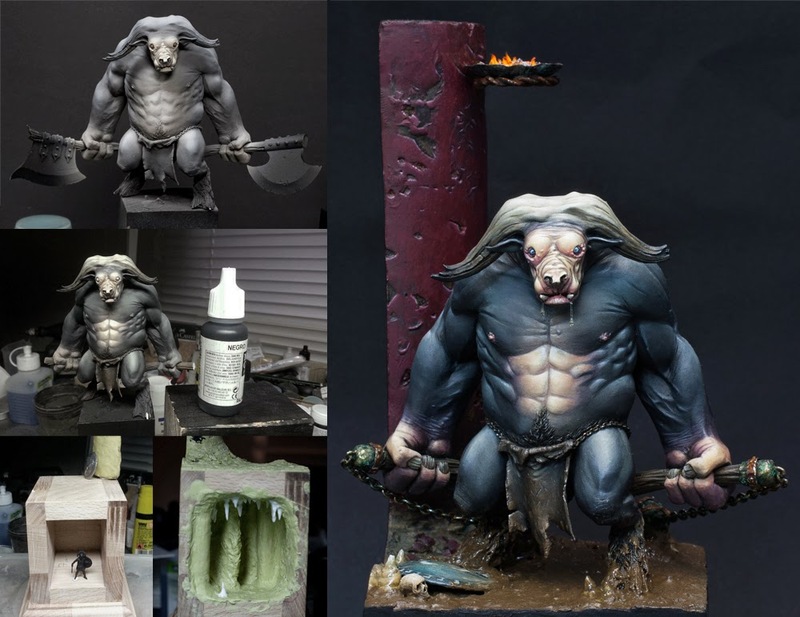 last week's tutorial voting is over and Massive Voodoo's year of the the painter is proud to bring you the Step by Step Article about "Theseus´ Destiny". So let's see what Peter has to tell about his work on this sculpt by Allan Carrasco. It´s always hard to start such a huge article without telling you something about the "vision" first. To be honest, Theseus´ Destiny was not a project with a long time of planning prior to it. Most of it just "happened". Back in February some good friends visited me in Reutlingen and we had a nice weekend with painting, chatting and a lot of other stupid things. While everybody was working on his own projects, I had one of PredaStore´s beautiful Predators on my desk. But somehow it was a lot of inner force needed to get on with it. As I know myself, in these situations it is best to stop the project and start something new... something with a better feeling and by this with more motivation. 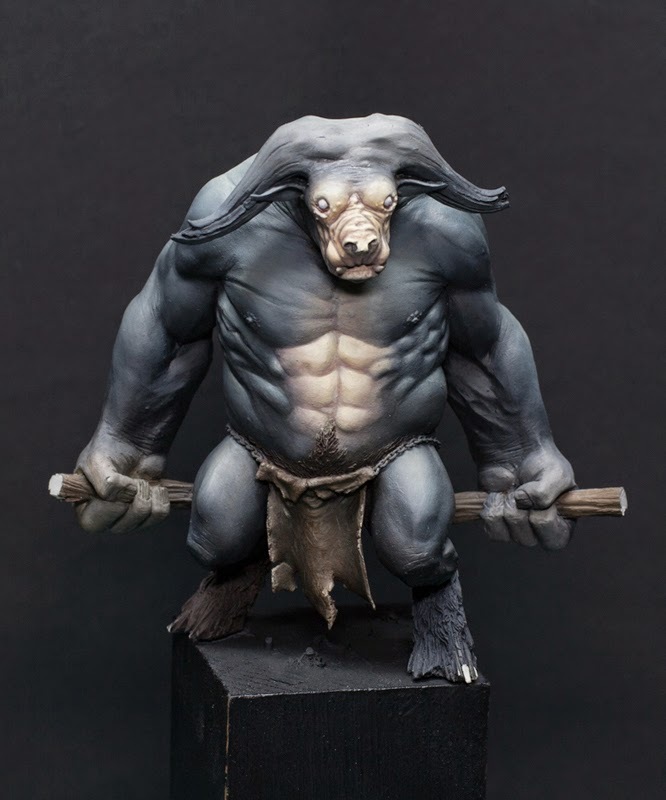 I bought Allan´s Minotaur some months before, but it was hidden deep inside my desk as I was honestly quite afraid of this huge miniature and its big areas of skin. But somehow (I´m sure it was the evil wine!) I took him out and decided that I would start him right now. As some you might know I´m very interested in history (which I studied) and ancient mythology. 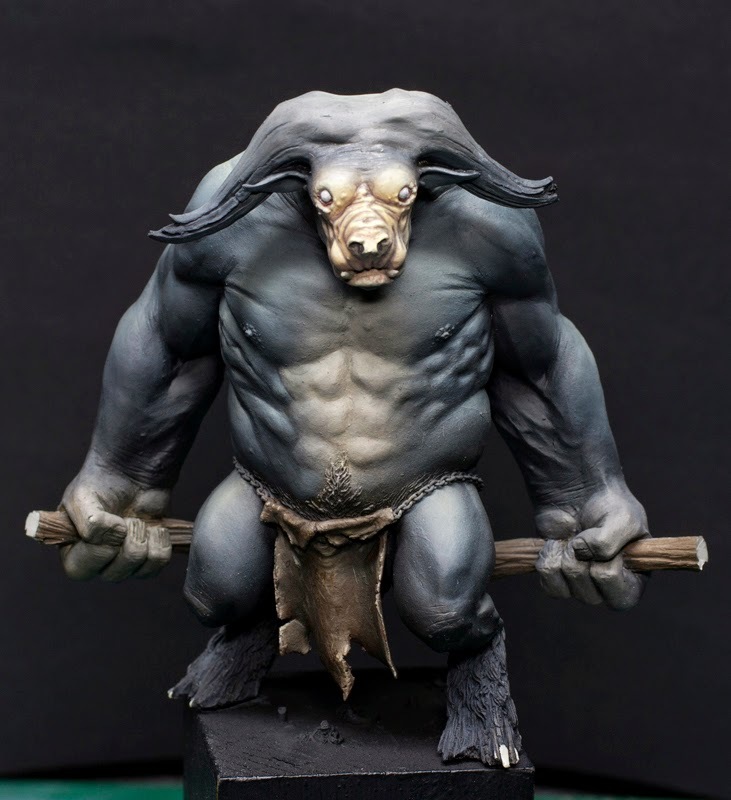 Right from the moment I saw Allan´s sculpt for the first time (a version painted by Raffa, names "Cow of War") I was reminded of the myth of Theseus and the Minotaur. Back in February it was time to implement this myth and finish it for the Duke of Bavaria Contest which was taking place two months later. Ok, enough of the theoretically blabla... let´s get right into it! 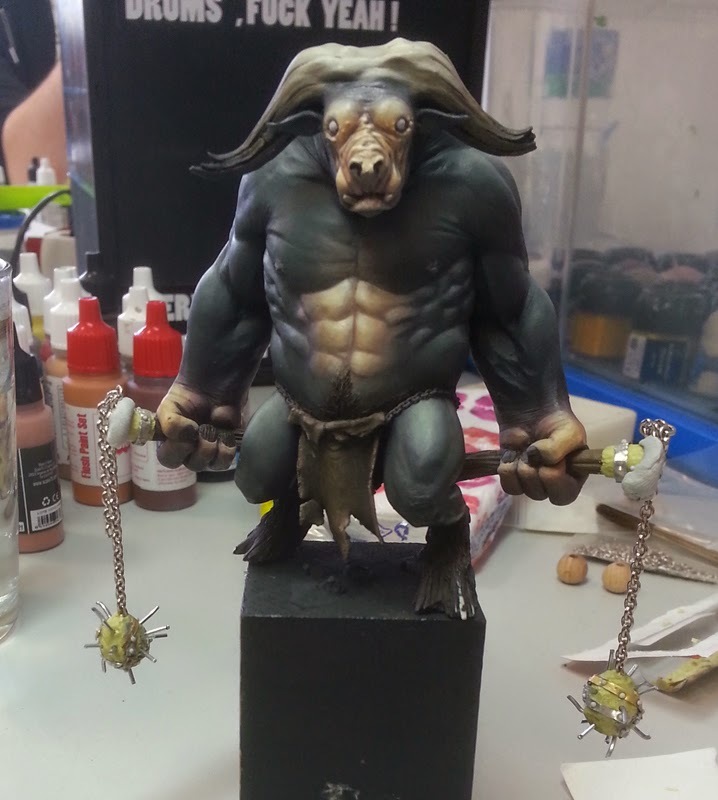 As Manu was on his task to get me a proper plinth for the scene, I started with the Minotaur. After the usual cleaning and priming process, I decided to use my airbrush for the first tasks, work most of the huge areas with oil colors and then finish it with acrylics. But what about the colors? 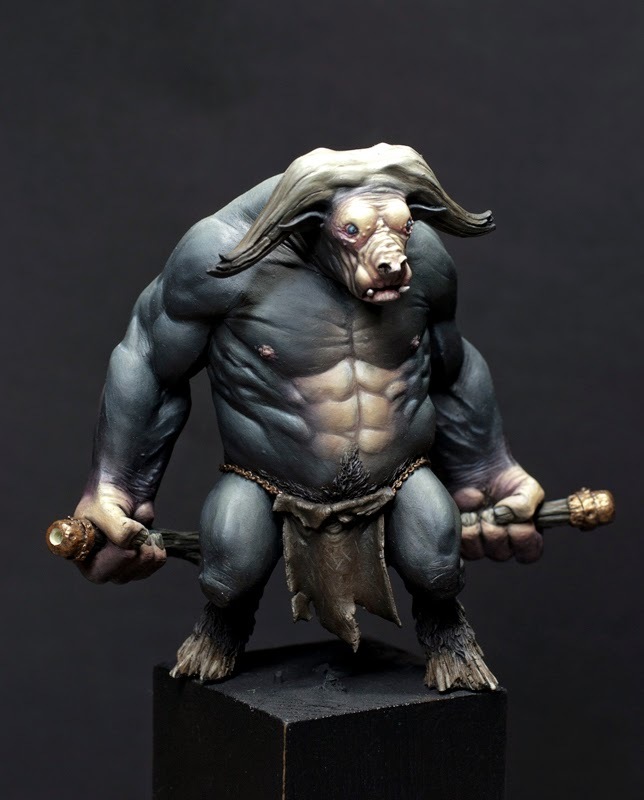 Well, I told you I was quite afraid of the Minotaur before because of its huge areas of skin. But on the weekend I was sure I would paint a black bull as it would represent pure badass power. Ok, most of you would think I was crazy and perhaps I somehow was (bad, bad wine!)... 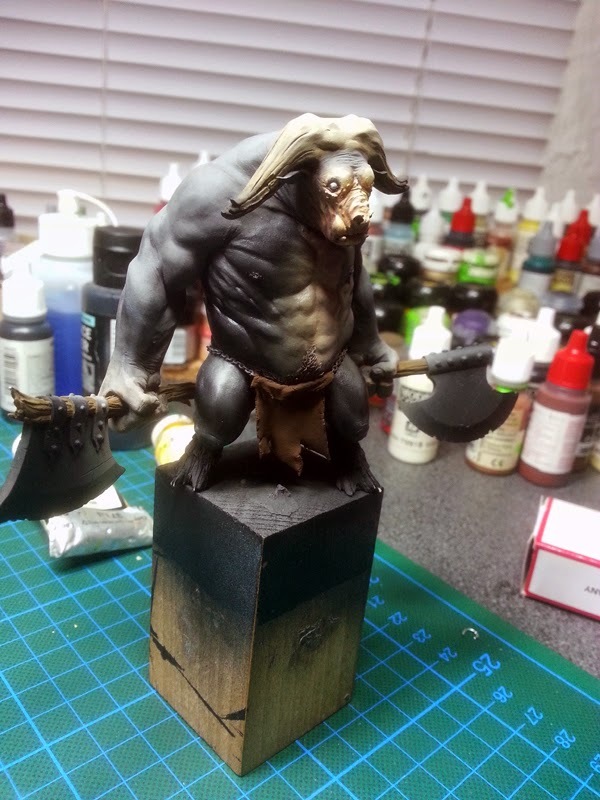 but painting black is not that hard as Roman tells you in his huge article :) To get more interesting color variations onto the mini I thought about using some kind of skin color on important areas (head, belly, hands). 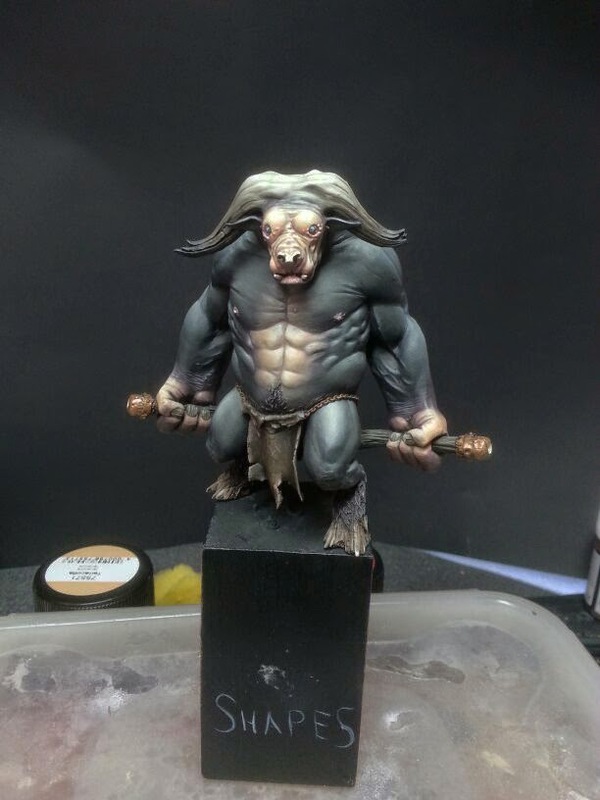 After I primed the Minotaur in black, I mixed black with a bit of yellowish white and carefully sketched the basic light situation. Why the yellowish white? Pure white is not the right choice if you want to highlight your colors. 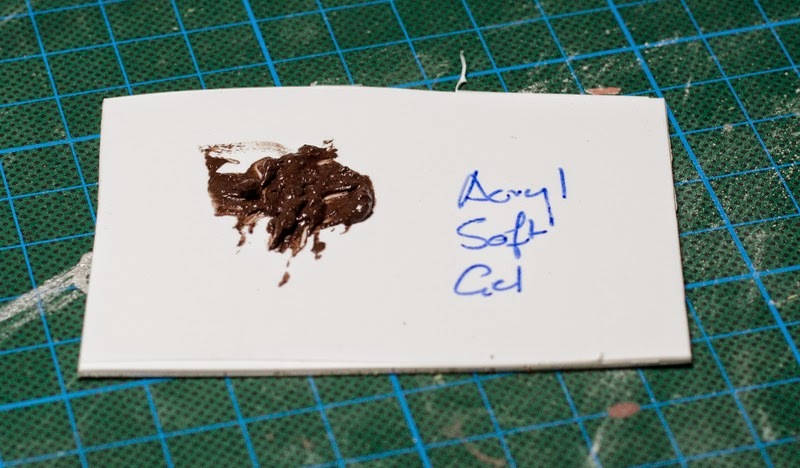 As it´s not a "natural" color it will make your blending appear "scientific". This might be cool if you want to highlight some kind of sci-fi surface, but for a skin it´s in my opinion misplaced. I for myself prever a mix of white and yellow to highlight any color and only use pure white for the final tiny highlights. Following the idea of zenithal light I highlighted areas where the light would be more intense. Allan sculpted the muscles nicely, so it was not a big deal to realize where the brighter color would have to be placed. 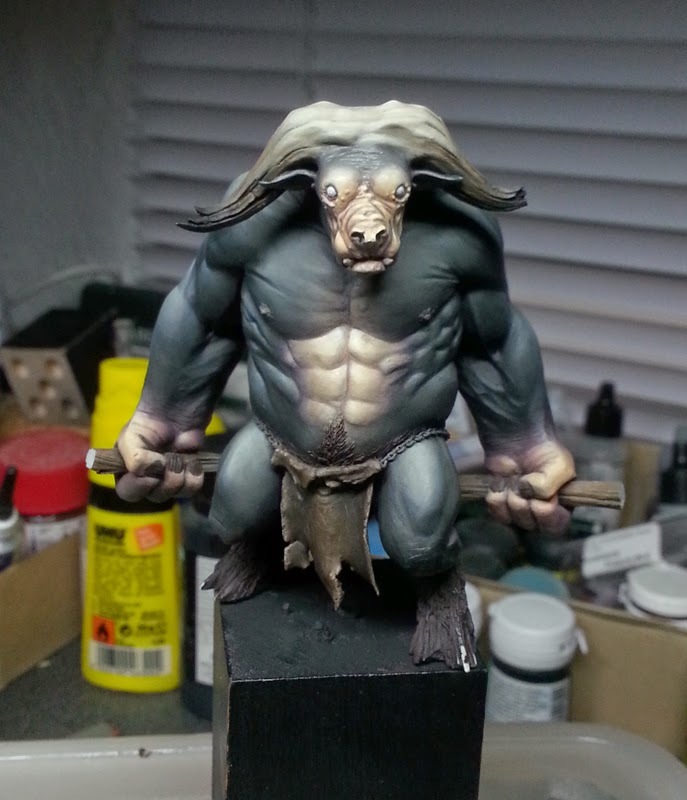 As you can see on the picture above, I also basecoated the areas on the belly, the head and the hands in a different color. For this I used my mix of black and yellowish white and added an lightly orange skincolor into it. After the first layer, I added a bit of white to highlight the areas where the light would be most intense. Now it was time to create a basic structure for the painting process. For this I applied the basic colors onto the leather, the wooden staff and the horns. I also started working on the face. I used different skin colors to give the "Mooh of Doom" some character. I also added some reddish layers to make the skin more interesting. For the horns I used a wet-in-wet technique to achieve a quick sketch. For this, apply your basic color (no mixture with water!) onto the model and while it´s still wet add your brighter or darker color (also here: do not mix it with water as everything will flow like hell) on the position you want it to be. Now carefully mix both colors at their borders into each other. You will get a rough blending. After the basic stuff, it was time to get started with the oil colors. They are awesome to use as it´s quite easy to achieve nice blendings on large surfaces. As the oils need some time to dry (at least 3-4 days!) I put the mini every day in a box to prevent it from being covered with dust (which is always flying around no matter how clean your flat might be!). You may laugh, but there is nothing more nerve-racking then having tiny flakes of dust upon you mini. The picture above is right in the middle of the "oil-stage". I´m very sorry for the crappy pic from my mobile, but I somehow forgot to take proper pictures :-/ I focused for about a week only on working with the oils. It´s not because they are so complicated to use, but the huge areas needed their time. To prevent myself from working everywhere at the same time, I structured the mini in six parts: right and left leg + torso, right and left arm, the back and finally the neck. Every evening I finished a part and believe me, it helped a lot. Finishing a stage and see your mini developing slowly is a big motivation. For the skin I used a very simple palette of oil colors: black and a yellowish white for the black skin. It´s all you need as the oils will make a nice blending. For the brighter areas on the hands and the belly I used a skin color and the yellowish white. Interesting effect: as I mixed the yellowish white into the black, the blue particles in the black (it´s usually nothing more than a very dark blue!) got more intense and the Minotaue got a blueish and bit greenish taint. Nice! Well.... I fucked it up... As you can see on the picture the oil colors basically worked out fine and I had some nice blendings everywhere. It was time to switch to acrylics in order to get on with the job (cleaning, color variation, highlights, etc.). 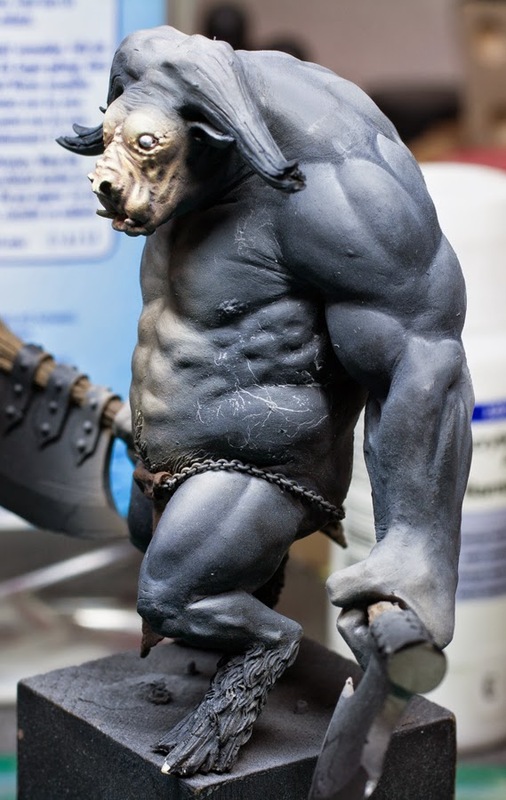 So, I put the Minotaur into the oven to speed up the drying process. As some of you might now I had an epic accident some years back, when I used oils for the last time. This time it would be different. I had a proper oven and was sitting in front of it for the whole time to prevent any "Peter-Events". After the shock I was motivated to continue the "Mooh of Doom". 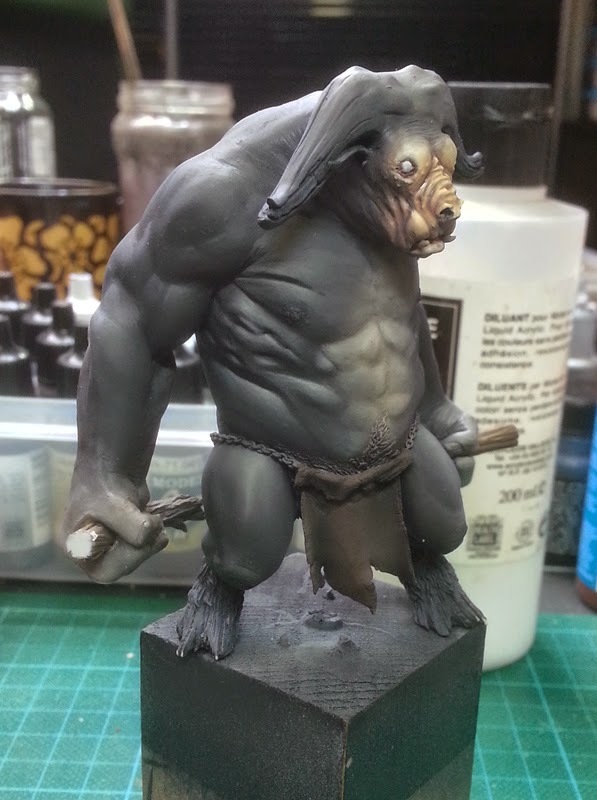 As you can see on the pictures, I focused on intensiving the contrast on the black skin and added some color variation on the belly, the hands and the face. 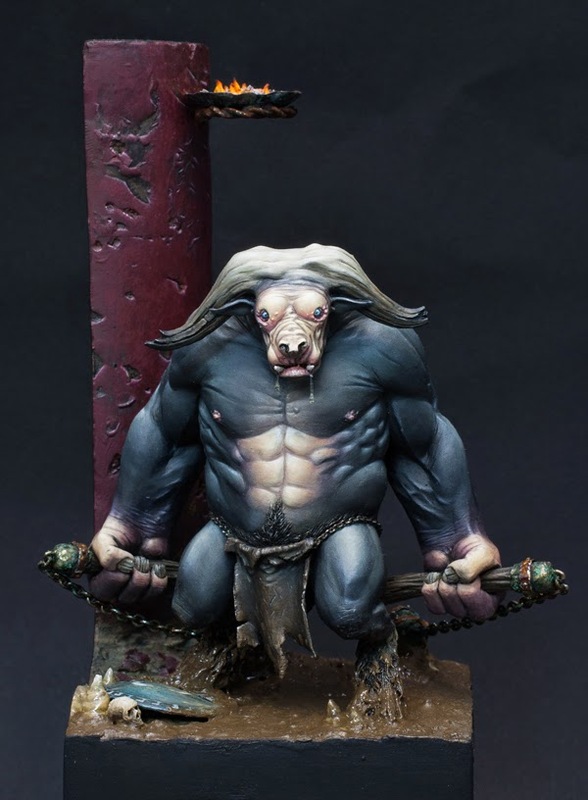 The contrast on the black skin was mainly done by very careful layers of pure black for the shades and mixes with yellowish white for the highlights. Where the yellow and blue pigments of the black caused a too intense greenish (yellow + blue = green) result in the highlights, I used soft glazes of grey to counter it. Increasing contrast is one of the most important parts while painting and so it took me about two weeks to get this done properly and clean. 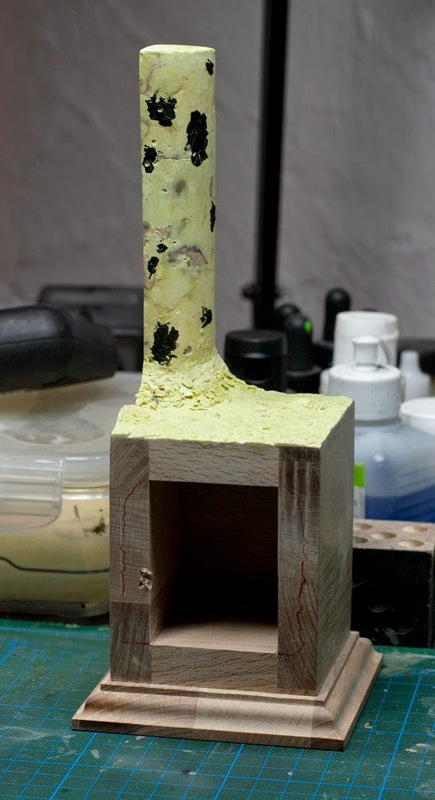 It followed always the same rythm: adding a layer, then using glazes to soften rough blendings. 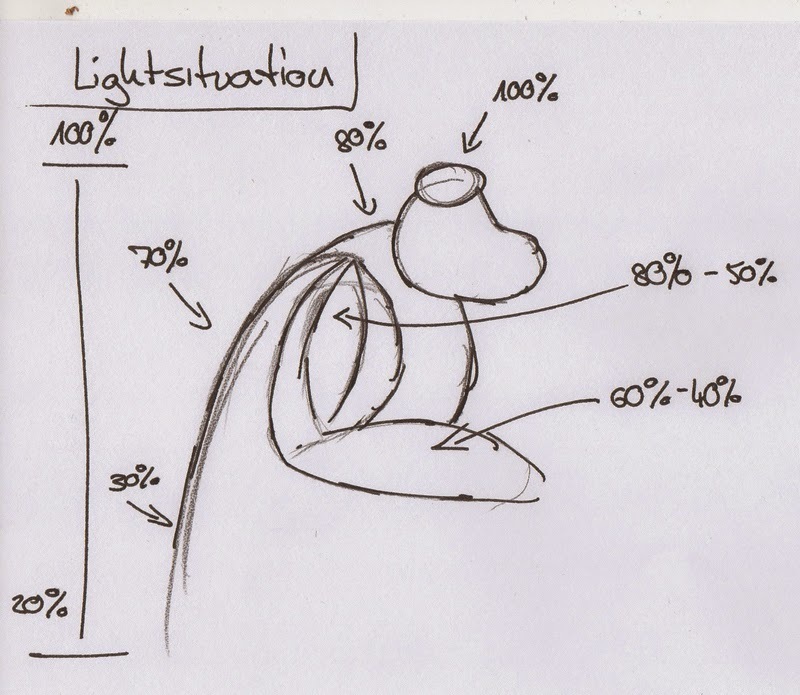 On the top point of the head there is 100% light where between your legs there is 0% light. This is the basic thought you always have to keep in mind. As you can see on the pictures above, the bull was almost finished when I took the pictures. Apart from the lightsituation I invested a lot of time in the color variation of the skin. 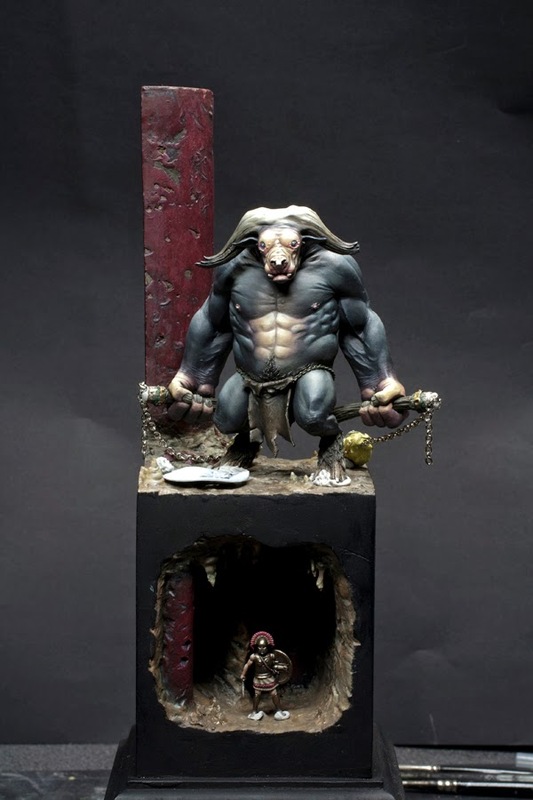 This is what makes a miniature look interesting: the play of colors. 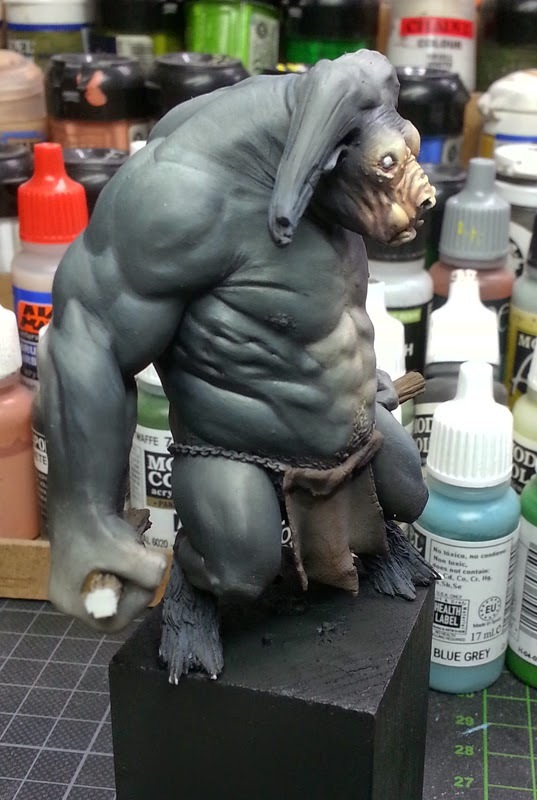 As you can see on the right picture, I added some reddish colors to the skintone of the belly and the hands. This helps the skin to look more "alive" and creates an interesting focal point in this huge black/dark area. To have a nice, harmonic transfer from the bright, reddish skin to the black one, I used glazes of dark purple. The choice of purple here was simple: To simulate a "natural" transfer of two different colors, you needed a mixture of both. 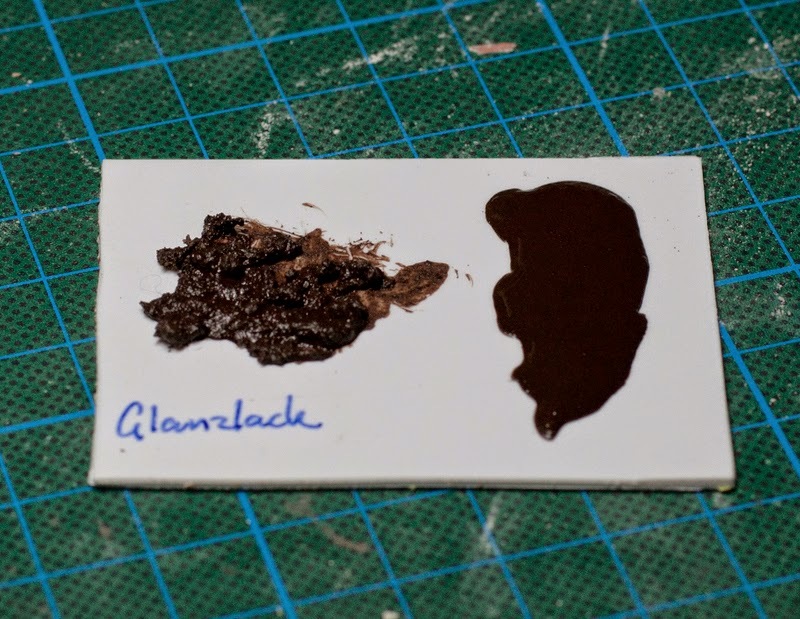 As I already told you, the black color contains a huge amount of blue pigments. If we mix blue and red, we will get our purple. In my opinion the dark purple worked perfectly and created a nice, natural looking transfer between both areas. If you remember one of the first pictures above, I started the horns with a brownish basic color and painted it black/dark grey during the painting process. To be honest I was not sure in which color I should paint them. So, I decided to use a simple dark/bright blending from black to nearly white. To make it appear more interesting I used dark brownish glazes in the midtones. The bright area in the middle would also support the most important focal point of the bull: his face. So, I combined a simple fact: usually red and bright areas attract our eyes the most. 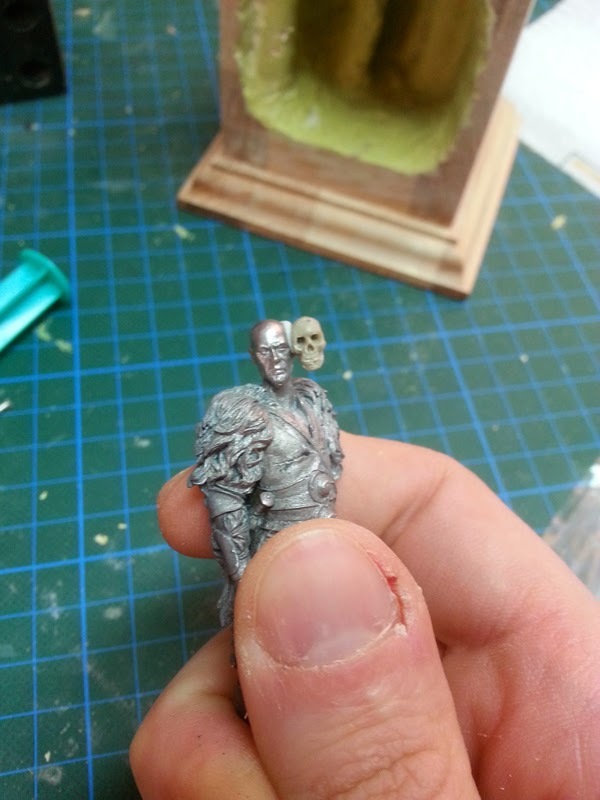 By using reddish glazes in the face, strong highlights and a bright spot on top of his head I maximised this effect. For the leather I chose a darker appearance. As you can see on the last two pictures I started with a quite "bright" brown and darkened it during the painting process with inks and blue/dark glazes. Roman also wrote a nice tutorial about leather, which helps you understand all necessary facts about this material and how to paint it properly: Tutorial - How to paint leather. 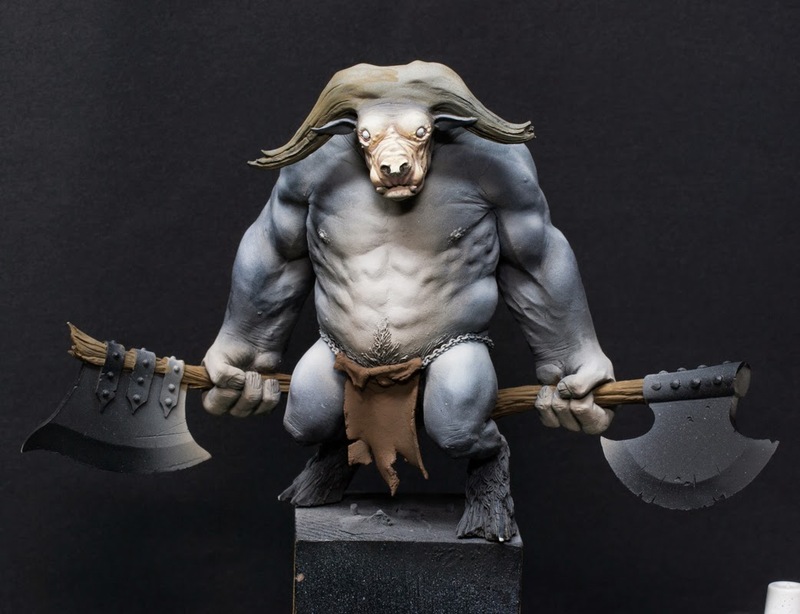 Allan armed his version of the Minotaur with two huge battleaxes. At the beginning of the whole painting process, I was still convinced that they would support the brutal appearance of the bull, but after the first two weeks my mind changed. While painting I realized that the axes were quite a handicap for handling the bull properly. So, I simply cut them off and working on the skin was much more easy. 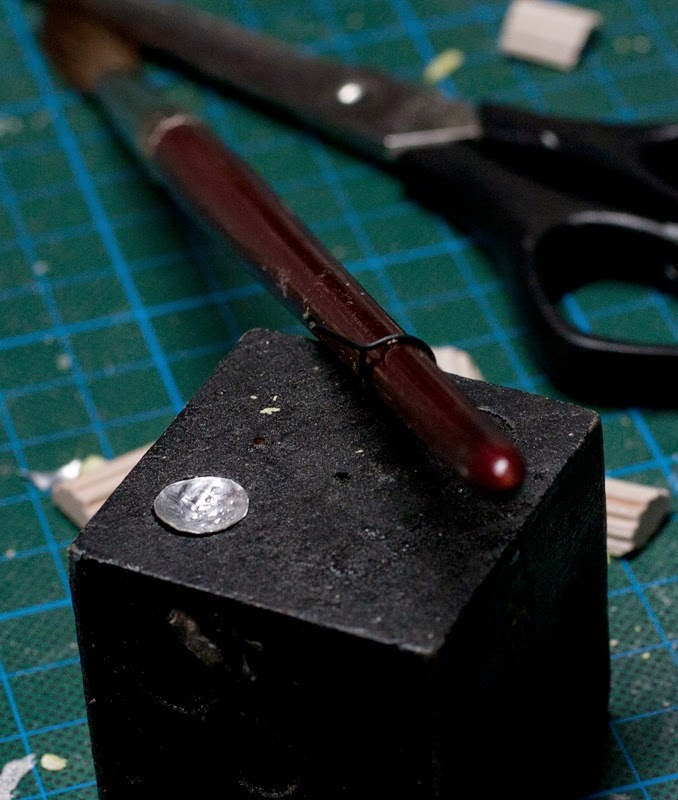 Important lecture for myself: before putting a big miniature together, think about the painting process and if there are parts which should be added later. But to quote Roman: everything happens for a reason. Now I could think about how the armature would support the story. With the axes the bull appeared rather static and this was not my vision of the Minotaur. In my mind he was wandering through the labyrinth, looking for intruders. So, what about something like flails? Yeah, this would be nice... this kind of weapon would support his brutish character and by pulling the flail´s bowls behind him, I could indicate some kind of movement... perfect! The flails were quite easy to create. I formed two irregular bowls with Miliput and added a small chain. As you can see on the left picture (an early stage) I also thought about using spikes. But as I did not like the look, I increased the size of the bowls and carved small pyramids into them (Thanks to Roman for the idea!). I also added small bands of lead foil to gain an archaic look (the idea: if I hit you with this flail you will turn into a bloody smear on the wall... I like..). To connect the chain and the axes´ shafts I sculpted a simple armature. For this I used Miliput and lead foil. The sculpting was done rather rough to indicate a primitive, but solid smith´s work . On the right picture you can see a later stage of the project. 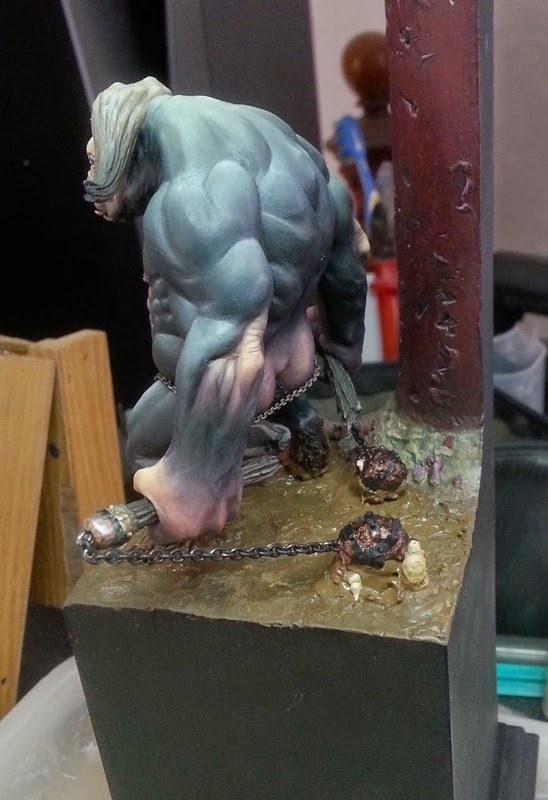 The bull and the base were nearly finished and I applied everything to check the scenery´s appearance. As I already told you, in my imagination the Minotaur´s labyrinth is some kind of dark cave beneath the palace of Crete. So, I thought to combine the rough atmosphere of natural rock with the architecual influence of mankind. To include two scenes of the same epic story on a rather small plinth, I decided to work with two different scale. 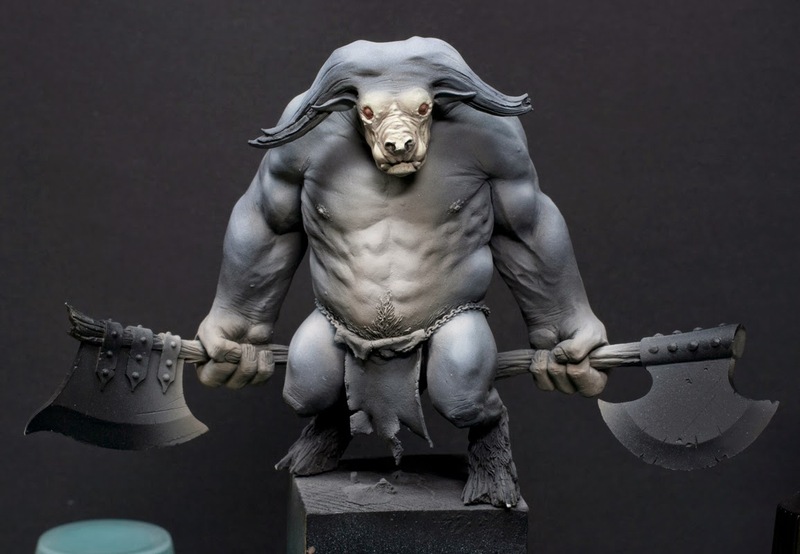 The "main scene" with the bull would be in 54mm scale while the "secondary scene" with Theseus on his quest would be in 1/72. 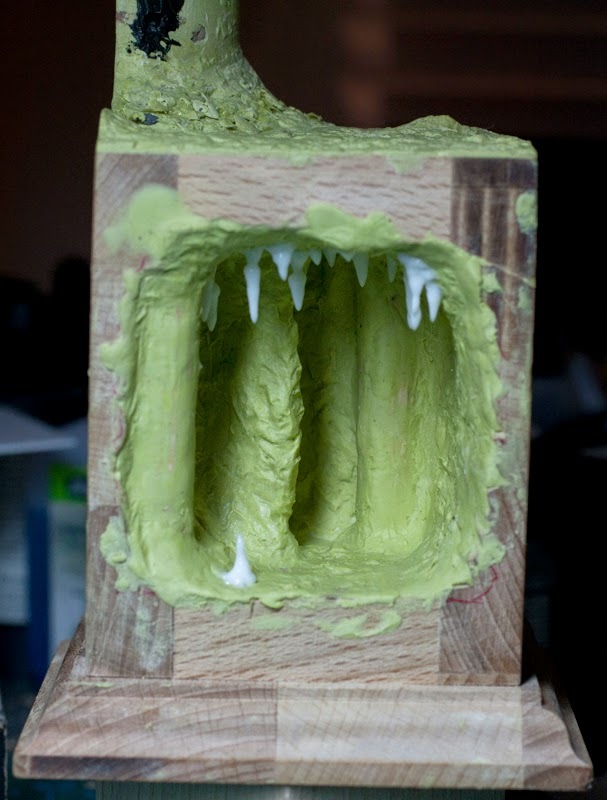 To connect both scenes I would use small details like mud, stalagmites and stalactites, a shield, a skull and braziers. A big thanks to Manu for creating the plinth for me. On the left picture you can see how he implemented my ideas of the cave. The hole was 3cm wide, about 5cm high and 4cm deep. It was the perfect preparation for the later cave. 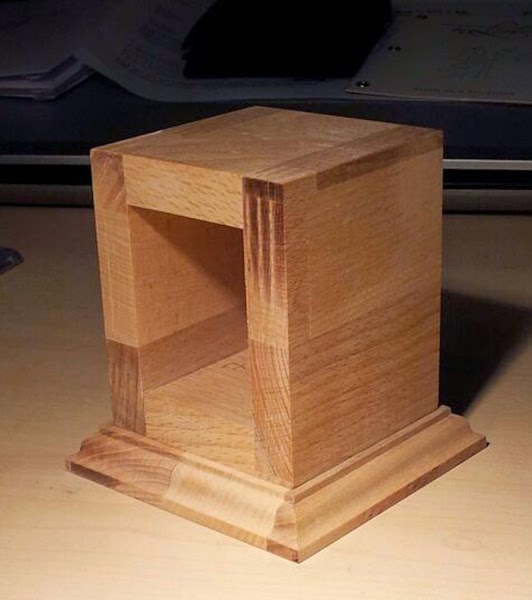 As a first step I build the column. I used cork for the basic structure and covered it with miliput. 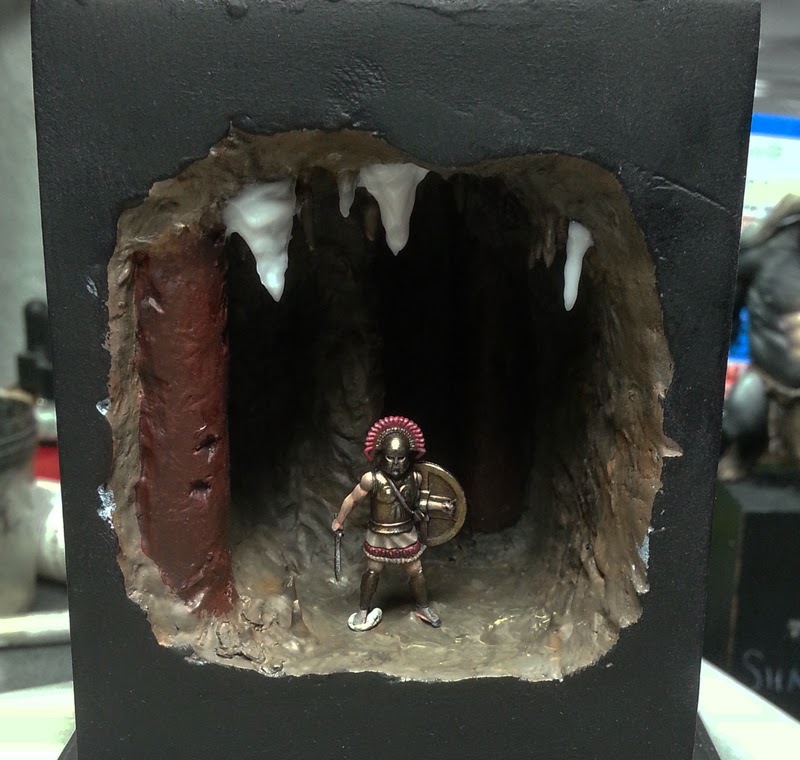 I made the column about 1cm higher than the Minotaur to create a framework for the scene and placed it on the left side. To place the higher frame on the left side was motivated by the natural way of how people in western countries read a book. You start on the top of the left side and continue down to the bottom of the right side of a page. I wanted to use this effect and help the viewer to "read" the scenery. Additonally to the column I created a basic rocky surface with miliput (combining nature and architecture). 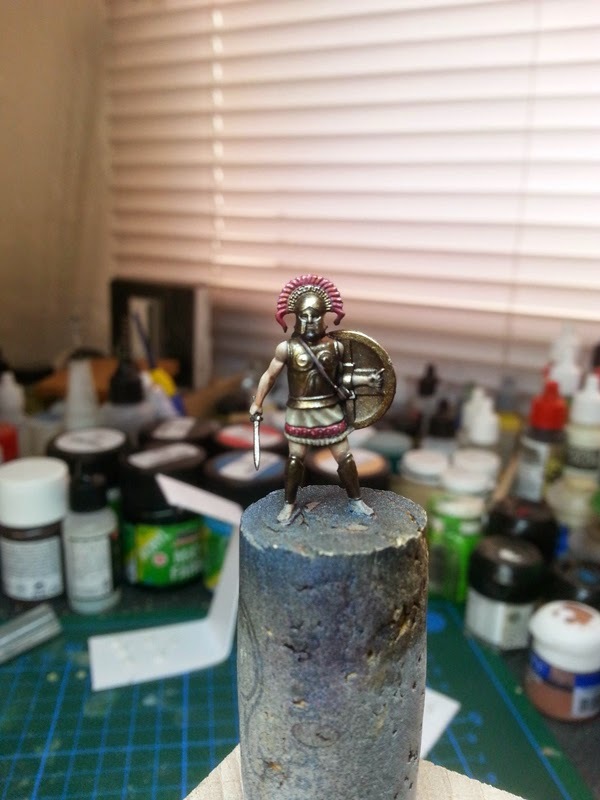 If you are interested in learning how to create a nice base I can only recommend joining one of Roman´s Basing Classes. 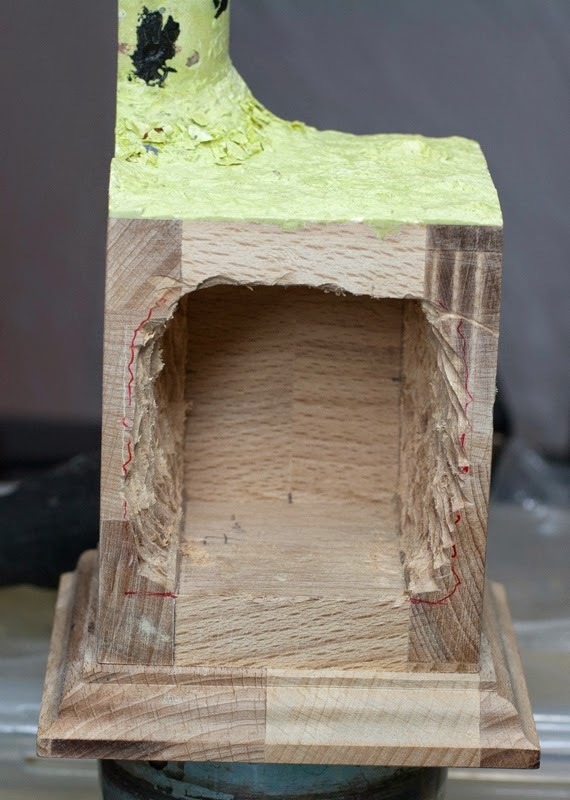 The following steps were simple: at first I used my Dremel to widen the hole and achieve a more natural appearance. Then, I sculpted the rocky surface with Miliput. To form the columns I used columnparts made of gypsum as a basis and covered them with Miliput. Some of you might ask why did I do this? Well, as I did some research, I discovered that in the Cretean culture round columns with a flat surface, possibly painted in red, dominated the architecture (Luke, thanks a lot for your help!). In my vision the Cretean builders sculptured the columns out of the blank rock and copied the style they used for their palaces. But here we have an old, wet cave. 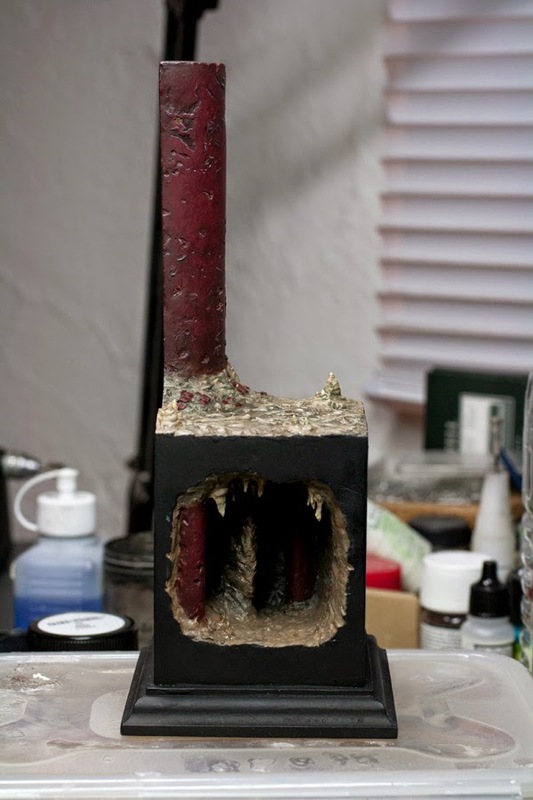 To support this idea, I did some experiments to find a good way of creating stalagmites and stalactites. 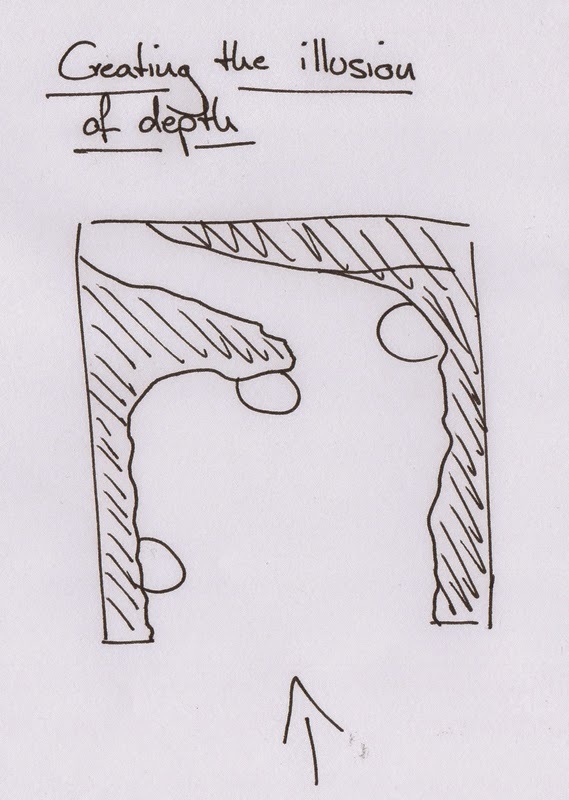 I placed them in both scenes in order to connect the "lower cave" and the "upper cave". Before I painted the base, I took care of small Theseus. I used one of the Spartan Warrios of the 1/72 Zvezda range. 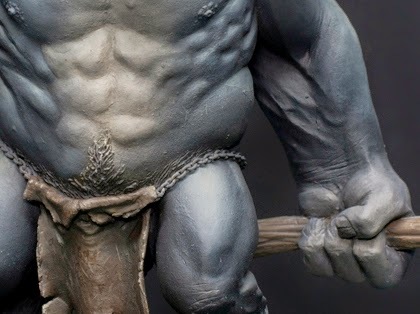 They are nicely sculpted and it took me only two hours to paint him. My idea was to use a rather simple scheme, but nevertheless outstanding and in contrast to the bull. So my choice fell on red, gold and white. The painting was an easy task. I used a wet in wet technique and combined brownish tones, blues and greens. To support the idea of a cave, the lower parts of the cave were painted brighter than the areas near the ceiling. The wet appearance of the cave was achieved by some layers of gloss vanish. The shield was painted in green to have a subtle contrast to the bull and the base. I also added a simple freehand. I did not invest too much time, as I would cover it with mud and dirt later. Now it was time to complete the whole project. 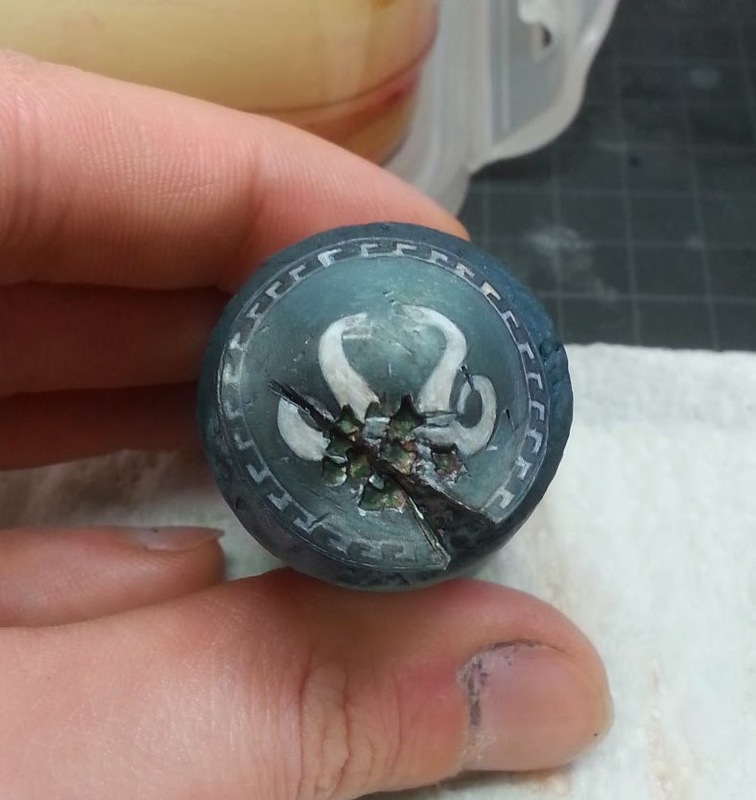 The bull was nearly finished, the base and the shield placed on the base. I needed a second element beside the stalagmites and stalactites to connect both scenes on a macro level (the shield and the skull were on the micro level). Wet mud was a logical choice. But how to do this? To find the best solution I made a quick experiment with gloss vanish and matt varnish. 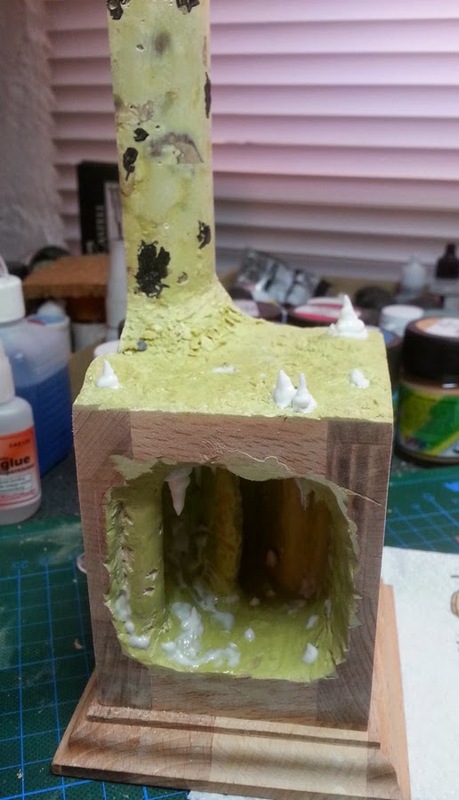 Finally satisfied, I covered the cave´s ground and the surface of the upper scene with the mixture. I "carefully" covered the bull´s hooves and the shield with the mixture in order to fuse the different elements with each other. 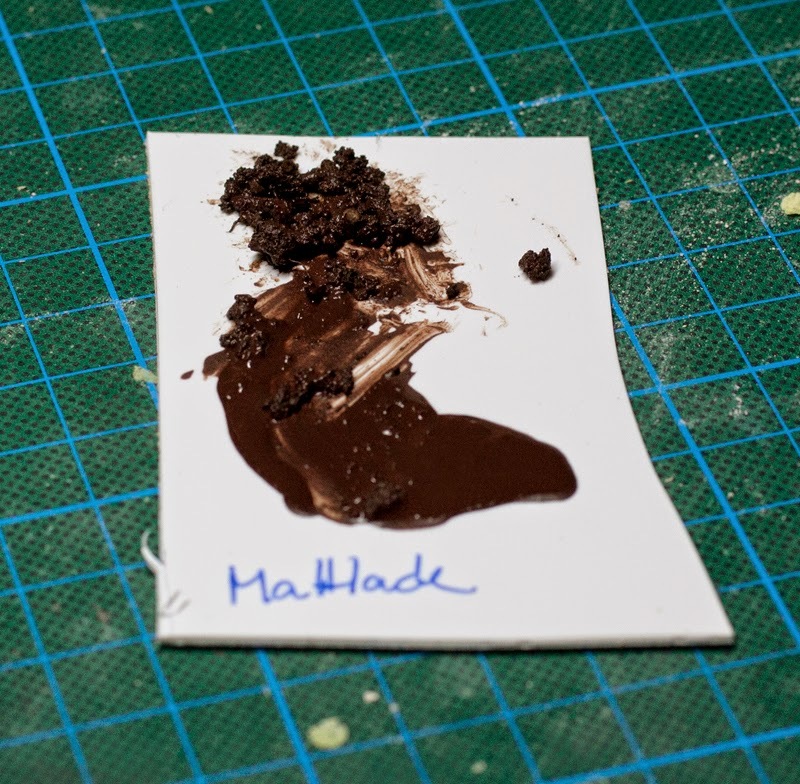 After drying, the muddy parts were covered with layers of gloss varnish to intensive the wet effect. Final dirt-effects were done with brown pigments. I was quite satisfied with the appearance of the whole scenery. But something was missing... I missed details. As I thought about it and had a look at some pictures of dungeons and temples I realized what it was: braziers! 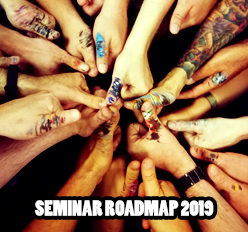 They would provide a simple, but nice detail and ensure two points: an additional connection of both scenes and the increase the human influence on the cave. 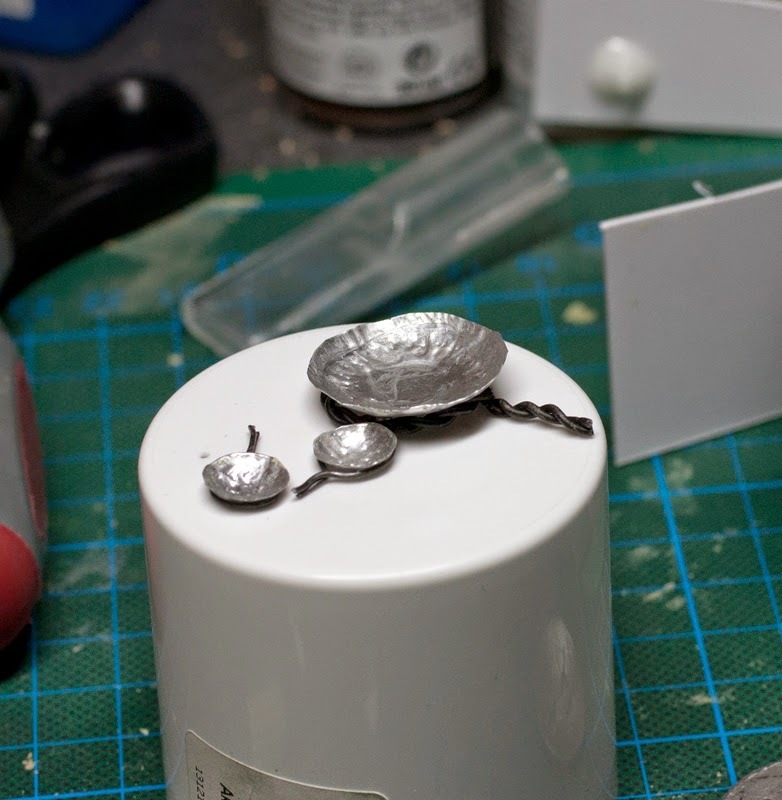 For the smaller cups I took little pieces of lead foil and placed the above a hemisphere drilled into a piece of wood. Then, I used the end of a big brush to carefully push the foil into the hemisphere. I cut the overlaying part and got a nice cup. The holding was made of small wire which was bend over the brush´s back (to get a nice circle). 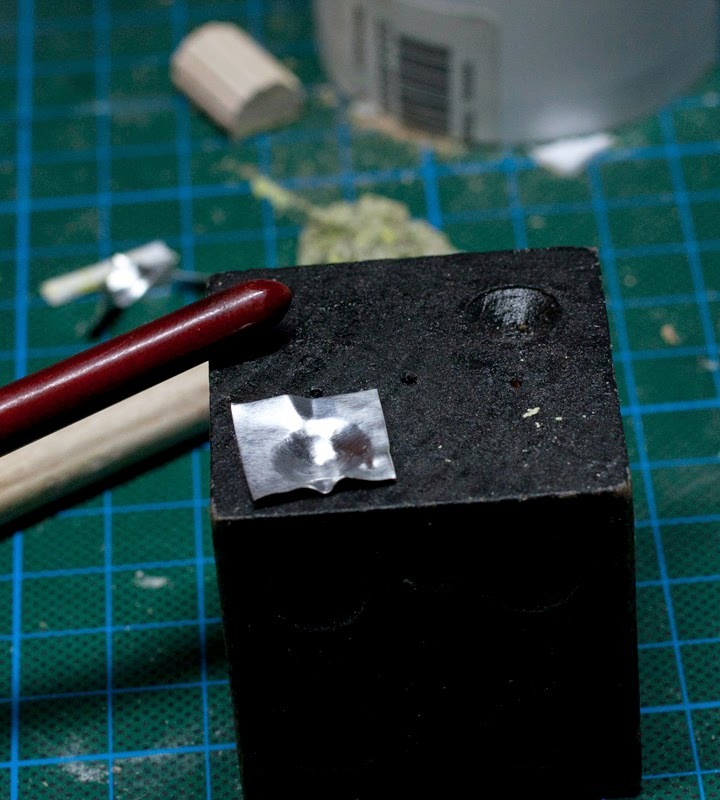 The bigger cup was done the same way: I took a larger part of lead foil and looked for something with a round surface. The pots of the old Citadel Colors are perfect for this. I placed the foil on the pots and used the back of the big brush again. I carefully pushed the foil into shape. Nice side effect: by using the rather small end of the brush the surface of the cup got quite rough and it looked like it was done with a hammer. Painting was quite easy: create a blending from bright (in the charcoals) to dark. I suggest to use Raffa´s glowing pigments to get a insense, glowing fire effect. Puh, what a huge amount of text. I hope you enjoyed this step by step article as much as I did, when I wrote it down. It was interesting to get back into my memories and try to explain every step en detail. I hope all points got clear. Preparation is important, but you can never be prepared for everything. So, in case of mistakes, relax, take a cup of coffee/tea and think about a solution. If you work on a large project, split it up into smaller steps.You can handle smaller projects easily and by this, you can handle big ones, too. If there are some points, which are not clear, please feel free to comment below and I will add an explanation into the step by step. What an inspiring tutorial! Thank you so much for sharing! I have to read this article again and again to soak up the knowledge in all the steps. Great article! I really like the outcome and in particular the base. 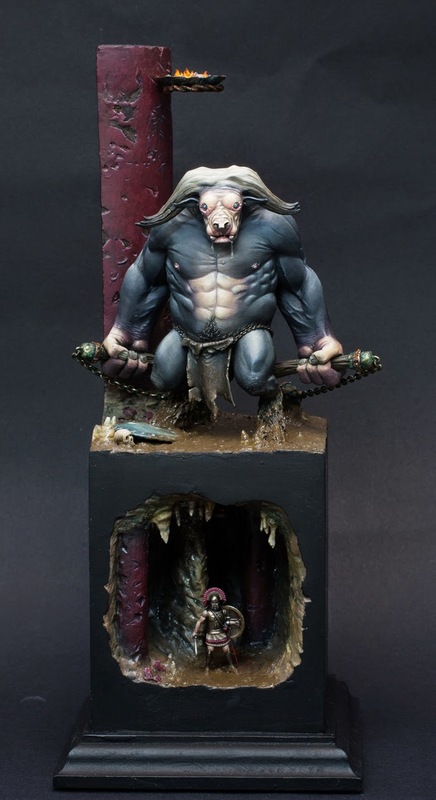 Love the idea of the cave build in to the base. Very cool article, Peter. I really enjoyed reading your thoughts on these many different aspects of your beautiful project. Well done! Really cool, thanks for your time and effort you did put in this one! Inspiring, thank you for taking the time to put down your thoughts. You guys are really on another level. That is an amazing article. I always love to read how other painters work on their projects. It helps me finding new ways, new ideas. No one can know, how many hours of planning, work, attempts & failures is behind the project. Big thanx for sharing, my favourite reading during past few days. Thanx for sharing. Hi Peter, I would like to know a bit more about how to sculpt the texture for the cave walls. 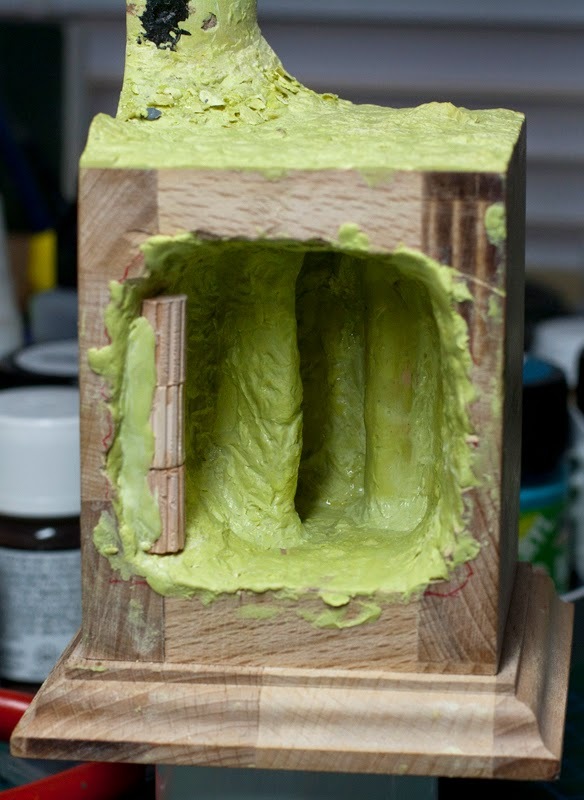 I am still a n00b when it comes to sculpting and using Milliput but I find myself using it more and more every time. That varnish trick also works when your matte varnish comes out "frosty." Well written Peter. I had the pleasure of looking up close in person during Fernando's workshop in Blumberg. A well executed piece! Thanks for sharing your thoughts and experiences with us.